New Magic Millions-winning trainer Chris Munce has joined Racing Queensland and miRunners in their revolutionary marketing partnership, which aims to offer premium and affordable racehorse ownership for Queensland racing fans. 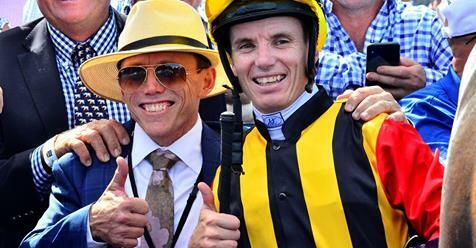 Munce, a Grand Slam-winning jockey, enjoyed his biggest thrill in racing as a trainer when Boomsara won the $2 million Magic Millions 3YO Guineas at the Gold Coast this month. The win also provided one of the best moments from the winners’ enclosure on Magic Millions day, with Boomsara’s large ownership group sharing in the excitement of winning $1.2 million. Racing Queensland CEO Brendan Parnell said Racing Queensland would provide marketing support to help attract up to 2000 more Queensland owners, with miRunners to purchase premium yearlings and offer affordable shares for fans. “Hundreds of owners enjoyed the thrill of winning at the Magic Millions earlier this month and Racing Queensland wants more people to experience the same winning feeling on Queensland racetracks,” he said. miRunners purchased two high quality yearlings at last week’s Magic Millions Yearling Sale, with the first, a filly by Written Tycoon (Lot 170), to be trained by the legendary Rob Heathcote at Eagle Farm. Munce will train the second yearling, a chestnut filly by Snitzel (Lot 249), sire of two-time The Everest winner Redzel. Munce said he looked forward to introducing a new generation of fans to premium level racehorse ownership. The model divides these yearlings into 1000 ownership units enabling fans of Queensland racing to taste racing a premium level thoroughbred for a small cost. “We need fresh faces in the game and with miRunners, fans can get involved at a low cost and enjoy the thrills of premium ownership. Many of Boomsara’s owners were first-time owners and for them to experience a thrill like that is what will keep our industry alive,” Munce said. The Munce stable offers highly engaging social and digital content for owners through weekly audio and written updates, spelling updates and, photos and videos of jump-outs and trials.